Okay, time for me to catch up here. I have so much going on in my life. It always seems to work that way once Easter hits. It’s like non-stop for the next couple of months. I’ve been knee-deep in a new blog for my personal stuff, a new brand for my business, my fam and this oil business. I’m trying to learn as much as I can and out of NOWHERE it’s become and actual business for me. I just didn’t see this coming. It’s been crazy lately. I’m ready for fall to come and Preschool to officially start for my girls. So I wanted to post my Project Life pages that I haven’t gotten around to sharing with you guys. Week 7, 8 and 9. This was a fun one to put together. No specific kit on this one because I wanted to stick with that pink and aqua color scheme. Valentine’s week. Close up on right side. I am in love with Project Life. I hope you are as well. 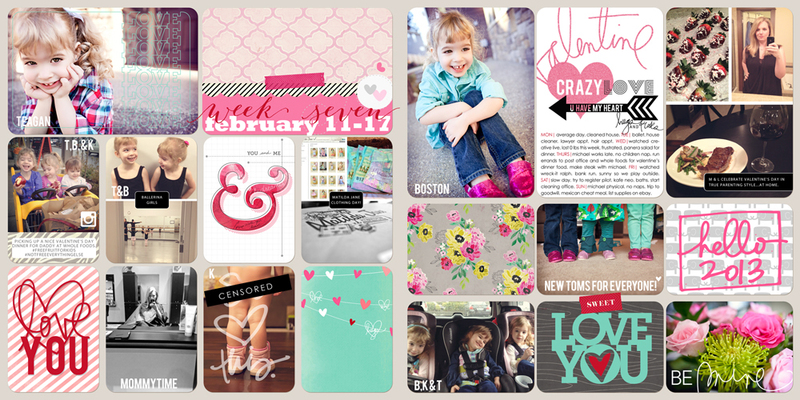 Where do you design and print your scrap booking pages from?